Since ascending on the national stage under head coach Tony Bennett in 2013-14, the Virginia men’s basketball program has taken on Duke four times in Cameron Indoor Stadium – 2013-14, 2015-16, 2017-18, and the much-hyped (deservedly so, as it turned out) latest installment this past Saturday. Duke has won three of the four contests; however, none have been decided by more than four points. Lucky for us, we get another look at this matchup in less than three weeks in Charlottesville. For now, here are a some of my final thoughts regarding the matchup between the then-AP no. 1 Blue Devils and the then-college coaches no. 1 Cavaliers on January 19. 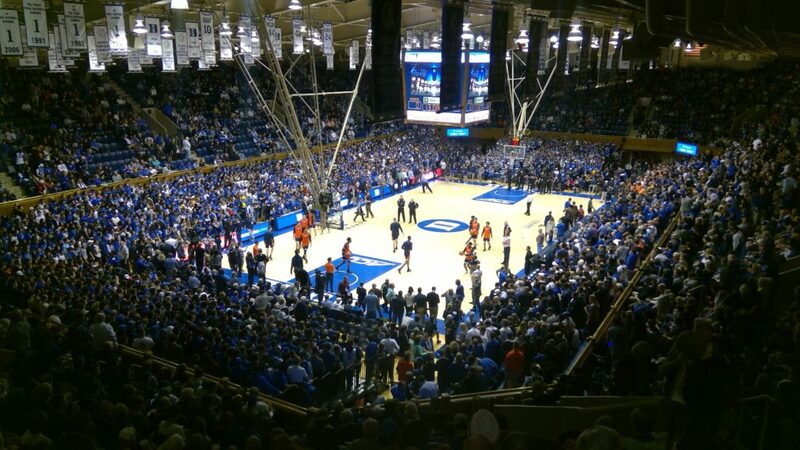 A look from my perch in Cameron Indoor Stadium for the Virginia versus Duke basketball game on January 19. Saturday’s contest between the Wahoos and Blue Devils was my first experience covering a game in Cameron Indoor Stadium. Approaching the arena, I passed by the “Krzyzewskiville,” the tented area for Duke students seeking to get into the Blue Devils’ biggest games. Virginia is over UMBC. It may be a different story come tournament time – I personally think it would be more of a motivator than anything else – but I can confidently say that this Cavalier team is not fazed in the slightest by last season’s NCAA tournament first-round defeat. The Duke fans tried to make it a factor with chants, a UMBC jersey on at least one Cameron crazy (come on, man), but none of it mattered to the Cavaliers. Cameron Indoor Stadium opened in 1940. Though it has been renovated four times, including 1988, 2002, 2008, 2009, there is very much an old-school feel. It is absolutely not for those with claustrophobia. It holds 9,314 people, though it doesn’t seem to be that many in the jam-packed arena. Duke’s locker room is right beside the press room, and you could hear how psyched up the Duke players were for this game. The fans, too. As Kyle Guy said, the atmosphere was “electric” and it was like that from the pregame to the end. The “crazies” mostly carry the atmosphere, but when Duke makes a run the entire arena joins in and it gets LOUD. It also gets hot. Seated in the auxiliary media section in an upper corner of Cameron (the ESPN Gameday crew was stationed down the line from where I sat), the heat wasn’t too bad there, though the further into the game I was noticing it more. It’s not just the noise and the fans hovering over the court, it’s the heat that certainly plays a role in Cameron’s home-court advantage as well. Overall, Cameron Indoor lived up to its billing as one of the nation’s toughest places to play, and I appreciated the history within the building. Duke’s five national champion banners are impressive. With Tony Bennett at the helm, Virginia being able to nab one as well seems to be a real possibility for the first time since the early 80s. The atmosphere was indeed electric to start, but I think Virginia was ready for that. What the Cavaliers weren’t ready for the dynamic play of RJ Barrett and Zion Williamson. Virginia seemed caught off guard by the dynamic freshmen and their ability to get to the basket. If you haven’t played against it, Barrett’s length and strength and Williamson’s strength and athleticism are impossible to prepare for. For much of the first-half, the Cavaliers were on their heels. The good news for the Cavaliers is that they should benefit from knowing what’s coming when the two teams meet in February. –The end of the first-half. Virginia had possession with 1:43 remaining and trailed by only one, 33-32. Guy had got a good look from 3 with 1:23 remaining but missed, one of five misses he would have in seven attempts. Duke scored two of its 11 first-half second-chance points on its next possession to take a 35-32 and then Cam Reddish came away with a steal, which led to a Barrett fast-break basket. Ty Jerome missed the front end of a 1-and-1, costing the Hoos a potential two points, with two seconds left and Duke had a 37-32 lead at the half. –The beginning of the second-half. Virginia forced Duke into a “gap,” which as Kris Wright explained is when the defense forces three straight stops. Duke didn’t score for the first 2:53 of the second-half, but UVA managed only a De’Andre Hunter layup in that span. Additionally, Virginia had two turnovers and was 1-of-4 from the field during that stretch. UVA would outscore Duke 11-5 in the first six minutes of the second-half, but a chance for a bigger run was there if the offense came out clicking. –The final 3:34. Now, Virginia struggled offensively in the final 10 minutes against Duke. After taking a 53-52 lead with 9:49 remaining, the Hoos would score only seven points over the course of the next 8 minutes, 56 seconds. But there were two big plays in the final 3:34 that started swinging the game to the Blue Devils. The first was a Ty Jerome missed runner with Virginia down 61-60 at the 3:34 mark. A good shot that came up just short. There was some controversy after the shot as well, as the referees called the ball out on Jerome, although it appeared two Duke players easily could have knocked it out. The Blue Devils were awarded possession and capitalized with a Barrett 2-pointer to take a 63-60 lead. On UVA’s next possession, Jerome found Guy wide open for a 3. The shot missed, and Barrett scored again for a 5-point Duke lead. Had either Jerome or Guy gotten those shots to fall, perhaps the game ends differently. Instead, UVA failed to score on its next two possessions – a Jerome 3 and a Hunter layup – before Duke junior forward Marques Bolden sank two free throws to give the home team a 67-60 lead with 1:08 remaining. “That’s one of the ones I wish I could take back. It felt great.” – Guy said of the open 3-point attempt he missed with Virginia trailing 63-60 with 2:44 remaining. Guy was 2-of-7 from 3 on the day, including a 3 with 24 seconds left to cut the lead to 69-66. Duke made its free throws, though, to seal the win. – De’Andre Hunter was outstanding in the first-half, showing why he is considered a potential first-round (maybe lottery?) pick in the 2019 NBA Draft. Duke had no answer for the redshirt sophomore from Philly, who scored 11 points on 5-of-7 shooting in the first-half. He finished with 18. – It’s good to see redshirt sophomore center Jay Huff continue to play with confidence. This is now 3-straight games in which he has played well, so he is well on his way to establishing a potentially important role for the Hoos this season. Conversely, redshirt junior Mamadi Diakite had some opportunities to make an impact offensively in the first part of the second-half. After Jack Salt turned the ball over on a pass attempt to start the second-half, Diakite had shots on three successive possessions. He missed all three. If UVA can get him going the second time around against Duke, he could be an x-factor in terms of post scoring. – My thought at the beginning of the second-half was how Duke’s Williamson seemed tired. He was breathing heavily, and Duke in general didn’t seem to have the same energy that they had in the first-half. It didn’t turn into an advantage for Virginia, however, as they were able to make the plays when it counted in the second-half. -I love the competitiveness of this Cavalier team, especially Ty Jerome and Jack Salt. Barrett of course was effective throughout, but late in the second-half I noticed Jerome calling for the challenge of guarding the talented freshman. Jerome doesn’t back down from anyone and flat-out hates to lose. And I think Salt relished the challenge of playing physical with Williamson. Virginia’s redshirt senior out of New Zealand did what he always does – play with tremendous effort. “Their defense was a lot of pressure, but it was easier to go by because it was so stretched. I think we probably should have taken more advantage of that.” – Guy on Duke’s defense and what was working for the Virginia offense. “This isn’t March. We’ve got a long way to go.” – Guy putting a January 19 regular season contest in context. “He’s quick. He’s quicker than what you see on TV. He’s really strong, so, just try to keep him in front.” – De’Andre Hunter on playing against Zion Williamson for the first time. “I never played against someone that quick, that strong. He’s a good player.” – More Williamson discussion from Hunter. “I think it was our defense. They are great players, but it was our defense. We weren’t as tight as we usually are.” – Hunter on what the bigger problem was – Virginia’s lack of defensive execution or the talent level of Barrett and Williamson? “It just shows that even on our bad days we’re still pretty good. But we still have things to work on.” – Hunter on what the loss says about Virginia. “It was really cool. He is a year younger than me so I kind of got to see him come through high school. It was just cool playing against him.” – Hunter on competing against fellow Philadelphia area native and friend Cam Reddish, a freshman at Duke. “Really happy. When it’s time for that game, we’ll be ready.” – Hunter on having the chance to play Duke again this regular season. What is really electric is when one team shoots 31 free throws and wins against a team that shoots 17. Shocking is perhaps a better description. Well, as noted, UVA was taking the ball to the rim Saturday night. Maybe CTB needs to take a lesson from the “Hall of Fame” coach. Chris, the shot you cited for controversy was called a time clock violation. The ball was clearly out on Duke, but that wasn’t the issue. Somehow the refs missed the fact that the ball had just hit the rim (with 3 seconds on the clock). If the horn went off for a violation, then the Duke shot clock keeper (?) is also guilty of an egregious error. (A foul could have easily been called on Zion since he bludgeoned Ty in going for that rebound.) Whichever call was made, it clearly should have been Virginia’s possession. I looked on the play-by-play breakdown and no shot-clock violation was cited. There is no way possible that was a shot-clock violation. Agreed that no matter what was called it should have been UVA ball. Chris, what a great article. Thank you for the perspective on Cameron and the excellent analysis of some key aspects of the game. Loved all the quotes from Kyle and Dre as well. Fantastic job! Unfortunately, the refs join in with the arena and are good for a few points — or at least a couple questionable fouls – during every Duke run … one of the things that makes it a very hard place to play.